We encountered this unusual squid while exploring an unnamed mound at a depth of ~850 meters (2,790 feet) during Dive 04. Its arms were folded back in what may be a defensive posture, but to such an extreme degree, it had lost its squid-like appearance. Video courtesy of the NOAA Office of Ocean Exploration and Research, Gulf of Mexico 2018. Download larger version (mp4, 37.9 MB). Dive 04 was remarkable for someone like me who is particularly interested in pelagic mollusks, including squids and the swimming snails known as pteropods, or sea butterflies. 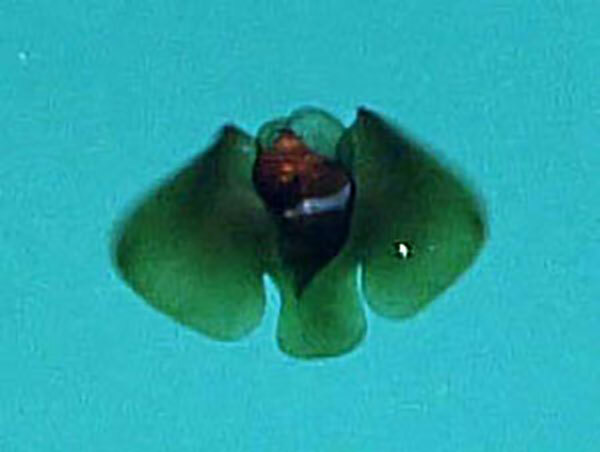 Early in the dive, D2 recorded a sea butterfly (Peracle bispinosa) from a deep-living group called pseudothecosome pteropods. Image courtesy of the NOAA Office of Ocean Exploration and Research, Gulf of Mexico 2018. Download image (jpg, 27 KB). 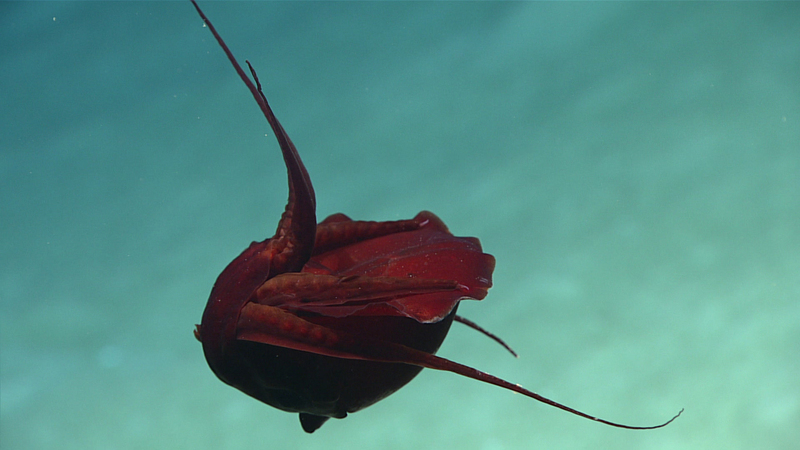 Early in the dive, remotely operated vehicle Deep Discoverer (D2) recorded great video footage of a sea butterfly from a deep-living group called pseudothecosomes. Because we have sampled the midwater community of this area extensively over the past few years as part of the DEEPEND project , I know that a pseudothecosome named Peracle bispinosa is quite common here. Photoshopping a frame grab from the video showed the shell to be consistent with this species. 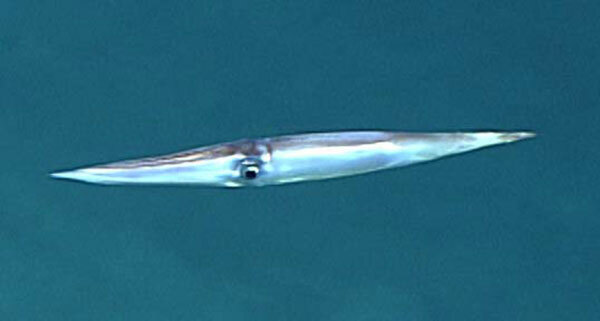 Several squids seen jetting quickly past at various times during the dive were a muscular species with a sharp end. This species of the family Ommastrephidae is called a bird squid, Ornithoteuthis antillarum , common in the deep waters of the Gulf of Mexico. Two others, however, were both noteworthy and more difficult to identify. Bird squid (Ornithoteuthis antillarum), a species of the family Ommastrephidae that is common in the Gulf of Mexico’s deep ocean. Image courtesy of the NOAA Office of Ocean Exploration and Research, Gulf of Mexico 2018. Download image (jpg, 18 KB). Determining the identity of the first squid was fairly straightforward. 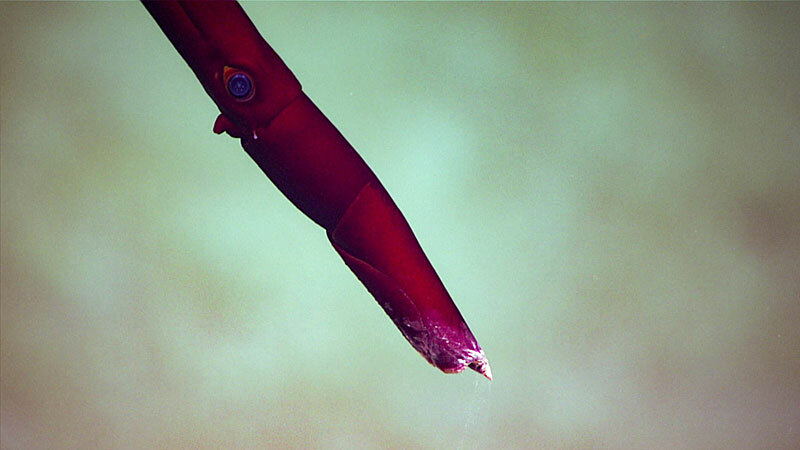 It was a long narrow squid, brick red in color, with fins about half of the mantle (body) length and ventral arms that appeared to be oversized. It clearly belonged to the family Mastigoteuthidae. Because their two long tentacles are skinny and have microscopic suckers (too small to see without a microscope), they are sometimes called “whiplash squids,” although this is a misleading name for this group, since they don’t actually lash their tentacles around like a whip. This long, narrow, brick red squid in the family Mastigoteuthidae was observed to have a small clear spot near its eye. That spot corresponds in location to a large, deeply embedded photophore indicative of the species Echinoteuthis atlantica. Image courtesy of the NOAA Office of Ocean Exploration and Research, Gulf of Mexico 2018. Download larger version (jpg, 615 KB). I know the squid fauna here fairly well, thanks to sample collections by the DEEPEND project. We have found four mastigoteuthid species in the northern Gulf of Mexico, three of which have a general shape similar to this squid. The most common has large photophores scattered across its underside, making it look somewhat like it has the measles. Distinguishing the other two species is difficult, but the squid observed by D2 on Dive 04 had a small clear spot near its eye, corresponding in location to a large, deeply embedded photophore on one of the species. Assuming the presence of that photophore, the species would be Echinoteuthis atlantica , which has never been seen alive before. While I was working on that identification, we came upon a truly amazing beast. At first, none of the observers on board or ashore could tell even remotely what it was. It looked vaguely like a sea cucumber, a strange jellyfish, or perhaps even a comb jelly. However, as D2 approached it and the animal rotated slowly in front of the camera, it became obvious that it was a squid. The question then became, what kind of squid? This squid had many researchers stumped. It was in a strange posture and was damaged; its long tentacles were missing and the ventral arms were mostly gone. The current best guess is that it belongs to the species Discoteuthis discus in the family Cycloteuthidae. However, that species has never previously been observed alive, and therefore it is unknown if this behavior in a contorted posture is common in this species. Image courtesy of the NOAA Office of Ocean Exploration and Research, Gulf of Mexico 2018. Download larger version (jpg, 680 KB). Based on our trawling studies, three squid families in this region have species with similarly short bodies characterized by fins that extend most of the length of the body. This squid was damaged. Its long tentacles were missing and the ventral arms were mostly gone. A lack of tentacles might indicate the family Octopoteuthidae, which is common at these depths, but the arm suckers were not transformed into hooks, eliminating this possibility. Therefore, it could have been either Mastigopsis hjorti , in the family Mastigoteuthidae, or Discoteuthis discus , in the family Cycloteuthidae. I have seen the former several times from submersibles but never in a posture or behaving like this observation. On the other hand, D. discus is so easily damaged and I have never seen one intact. Based on this background, my best guess is that our very strange squid, which – unlike some reports of it – was not twisted but contorted, is D. discus. Toward the end of the observation, I said on the audio feed that I thought the squid might be a cycloteuthid. That comment was misinterpreted in early press reports as the genus Psychroteuthis, an “ice squid” endemic to the Southern Ocean around Antarctica. Someone else commented that the color was reminiscent of a vampire squid, so unfortunately some press accounts said that scientists thought it might be a species of Vampyroteuthis. When we come across a strange observation during our exploration of the deep, it is tempting to speculate about what it is. We may try quickly to associate it with something familiar as a possible explanation. However, it is important to remember that first impressions are often speculative, and are not necessarily the final answer.